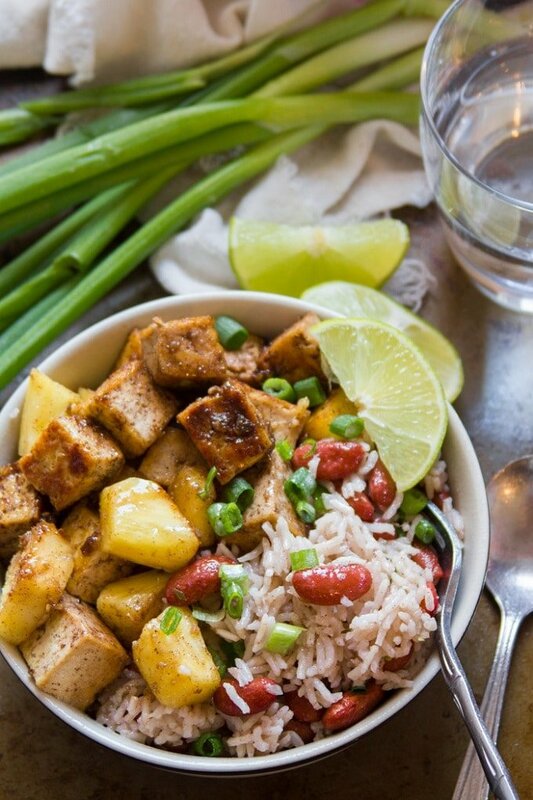 Spiced coconut rice and red beans are layered with sweet and spicy jerk tofu and pineapple chunks to create these mouth-watering Jamaican-inspired bowls. Did you know we just wrapped up what is statistically the hottest week of summer? We did, where I live at least. I seriously (okay obsessively) keep an eye on these things, which is why I know that in southeastern Pennsylvania, the average daily temperature peaks from July 14th to 20th. Which means it’s all downhill from here, folks. Whew! Autumn is coming. Eventually. In like two months, assuming I can make it there without melting. I can almost taste the pumpkin spice lattes. But in the meantime, I’ll do my best not to get to grumpy and enjoy what I can about summer. I went to Jamaica once, and you know what? Even though it was hot and humid, I managed to enjoy myself pretty well. I guess unlimited drinks all day can have that effect. I didn’t have jerk anything when I was in Jamaica, but I always heard that jerk anything was delicious. So I decided to try creating some jerk flavored vegan food. This whole meal is seriously inauthentic. But it’s also super tasty, so who cares? These bowls start with a layer of rice and beans. You’ll use long grain rice and cook it with a mix of coconut milk and water, the same way I do with my Thai coconut rice. I really like basmati rice for this, but any long grain white rice will do. Season up the rice with some thyme and allspice, and simmer it with a can of beans. Scallions go in at the end. I could make a meal of this part of the dish alone! 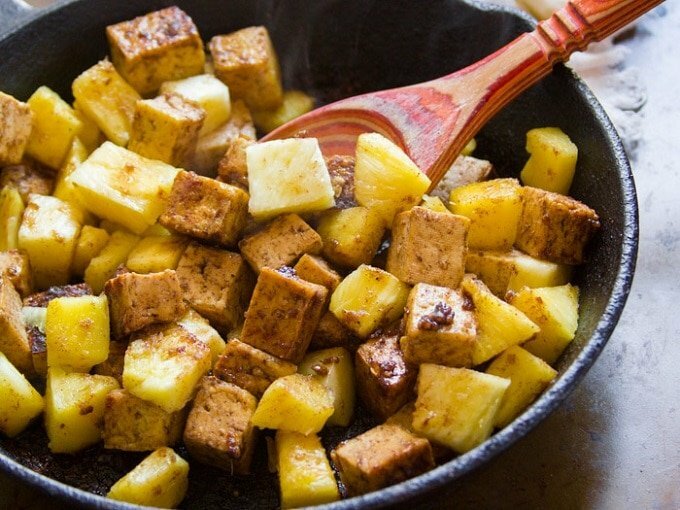 Pan-fry the tofu, and then pan-fry some pineapple. Douse everything in sweet and spicy jerk sauce. Spoon everything into bowls and dig in. 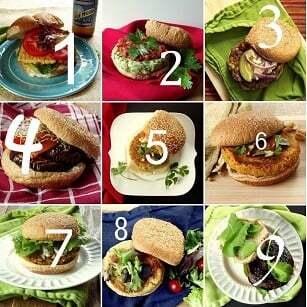 For some tips on how to pan-fry perfect tofu, check out this post. I was on the fence as to whether to make these bowls with pineapple or mango. Will somebody try it with mango and let me know how it turns out? Whatever you do, don’t peek at your rice while it cooks! My husband always tries to do this and I have to kick him out of the kitchen. Set the heat to low, cover it up, and leave it alone. This recipe calls for a habanero or Scotch bonnet pepper. Both varieties are hot! If you’re not into heat, cut back on the amount, or leave it out. If you are really into heat, use an extra pepper and/or include the seeds. Spiced coconut rice and red beans are layered with sweet and spicy jerk tofu and pineapple chunks to create these mouth-watering Jamaican-inspired bowls. It's like a trip to the Caribbean for your face! When the oil is hot, add the onion. Sauté for about 5 minutes, until soft and translucent. Add the water, coconut milk, thyme, allspice, salt, rice and beans. Raise the heat and bring the liquid to a simmer. Lower the heat until the liquid is at a low simmer. Cover and allow to simmer for about 15 minutes. Allow the pot to sit with the lid on for 5 minutes before uncovering. Remove the lid, fluff with a fork and stir in the scallions. While the rice simmers, stir the molasses, soy sauce, lime juice, garlic, ginger, habanero or scotch bonnet pepper, allspice and cinnamon together in a small bowl. Add the tofu to the skillet in an even layer. Allow to cook for about 10 minutes, flipping once or twice to achieve browning on multiple sides. Add the pineapple to the skillet. Cook for about 3 minutes, flip and cook about 3 minutes more, until softened and lightly browned. 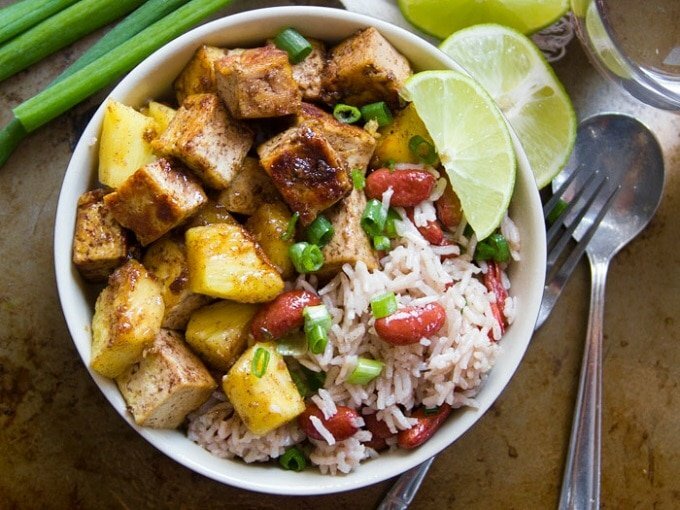 Return the tofu to the skillet and pour the sauce over the tofu and pineapple. Flip a few times to coat everything in the sauce. Cook for about 2 minutes more, until the sauce thickens up just a bit. 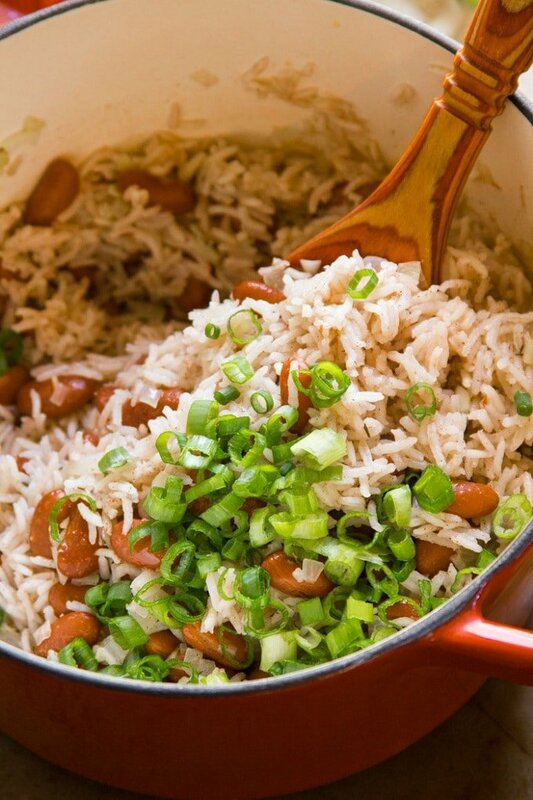 Divide the rice and beans among bowls. Top with the tofu and pineapple. Serve. What do I do with the habanero? It goes in with the sauce. I just updated the recipe to clarify – I just had it in the instructions as “pepper,” so I see how that could be confusing! Yum!!! I rarely have the time to make other peoples recipes as I am so busy writing my own, but you better believe I will be making this one!! Perfect comforting summer food. Can’t wait! Ha! I never have time to make other peoples’ recipes either, so I totally know the feeling! I hope you enjoy this one! I made this with pulled jackfruit instead of tofu and it was so good. I also could eat just the beans and rice part but put it all together and it was extremely tasty. Definitely a keeper! Oh awesome idea! I’ll have to give it a try with jackfruit! I’m so glad you enjoyed it! Ha! You guys sound like my husband and me. Our latest thing is discussing getting a summer home in the southern hemisphere so we can avoid summer altogether! I tried this recipe with mangos and it’ wasn’t delicious! Perfect combo of sweet and heat! Also used jalapeños and brown rice bc that’s what’s I had on hand. Yum! Thanks for the amazing recipes! Yay!! I’m so happy to hear that and hope to try it myself with mango soon! i mean, i wouldn’t mind seeing what recipes you could come up with if you did drink pina coladas all day – ha! ;) but this looks awesome! can’t wait to try it. Haha! I’ll make a note to do some recipe brainstorming next time I have something to drink. Should be fun! This was really good. Will try with mango next. This looks awesome! Is there any substitute for molasses or is that crucial to the recipe? I’ m sorry but this was an awful dish for me. I am vegan, I love tofu, rice, and beans, but I did not enjoy these flavours at all. It’s fussy, and I bought a fresh pineapple – and blah. I threw most of it out. Made as written and it is sooo good! Next time we will probably add pineapple juice to the jerk sauce so there can be more sweet in every bite with the spicy! Our rice came out looking more like traditional red beans and rice than these photos. Perfect, comforting dish for this cold snap we’re having! I’m glad you like it! Pineapple juice would be delicious in here!